Echidna was founded in the year 2001, in the city of Vila Nova de Gaia (Portugal). It took 4 years for the band to achieve a reasonable stability and coherent objectives. During this initial period Echidna focused on a need to grow up as a band and tried to define the goals and objectives that would lead to what Echidna are presently. The first live appearance took place at the well-known concert house of Portugal, Hard Club in March 2005. Between this first concert and the end of 2006 Echidna gathered a reasonable amount of live appearances and even won first prize for two times on different band contests. Echidna was growing and this sudden flow of concerts gave the band some notoriety in the Portuguese Metal underground. Eventually, reviews were made online and on Portuguese metal magazines. Above everything else, the global feedback from their listeners was great and a studio recording started to become imminent in the band’s path. Having this in mind Echidna decided to record a self-funded demo with 6 tracks called “Tearing The Cloth” at “Fábrica de Som” studios with the producer Daniel Carvalho. Although the recording process took longer than initially planned, Echidna managed to finish the post-production of the Demo in November 2006 and in January 2007 “Tearing the Cloth” was ready to become public. 500 copies were independently released and distributed in Portugal, receiving excellent reviews from metal magazines, webzines and blogs, as well as from the general listeners of Metal in Portugal. During 2007 Echidna focused on promoting their most recent recorded work, playing live throughout Portugal and gathering new fans along the way. 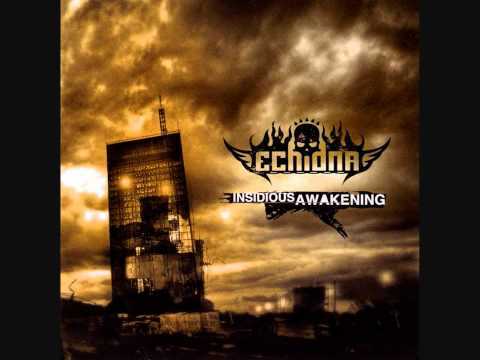 By the end of this year full of activity, Echidna knew it was time to grow up and acquire maturity and stability, which lead the band to decide recording again, this time the objective was to create a full length album that could present clearly what the band was capable of – “Insidious Awakening”. The album was recorded and edited once again at “Fábrica de Som” studios with Daniel Carvalho, and mixed and mastered by Daniel Cardoso at Ultra Sound Studios. By the end of January 2008, the album was ready and it took another 4 months until Echidna managed to sign with Portuguese lable “Rastilho Records”. “Insidious Awakening” debut album will be released in June 21 in Portugal, Germany and the Netherlands, and currently Echidna’s goal is to distribute the album worldwide and hopefully keep the ascending path that is present from the beginning. Echidna's current line up is with Tiago Cardoso (drums), Pedro Lima and David Doutel (guitars), Miguel Pinto (bass) and Bruno Capela (vocals). "Dawn Of The Sociopath" is the second full-lenght album, comming out on October 2011.